This year I have traveled a lot and get chance to explore almost all the travel websites in India. Makemytrip.com, travelguru.com, yatra.com, ezeego1.co.in are some of them but found cleartrip.com most amazing not only for look and feel but also for good service. I have my views for this website are layman’s point of view no technical aspect, just experience i.e. user experience. The site is very simple looking with white back ground, black text and default blue colored links. This feature rich site is fast and smooth. 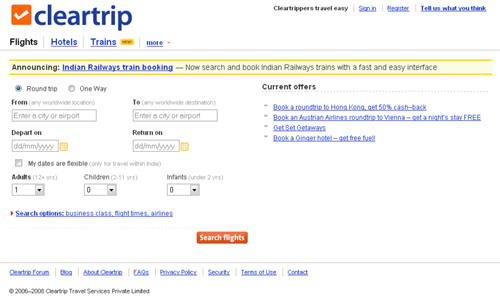 Flight & train tickets and hotel booking have plain, to the point interface, no distraction at all. 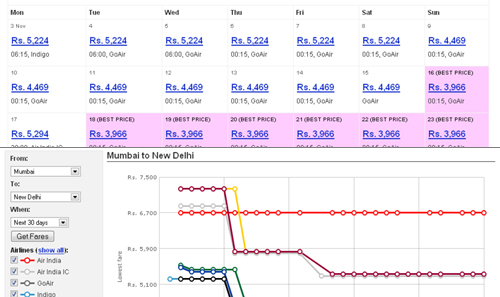 Best part of this travel portal is “MORE”; under this menu you will find some very interesting links for Air fare calendar, Air fare graphs and Air fare alerts etc. I am not going to write much, just review your-self and experience the rich experience. Hey! Don’t forget to click on “Small World” link under MORE.